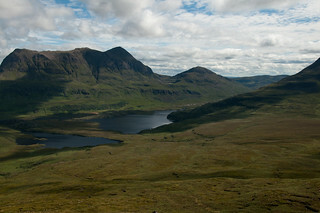 The area east of Lochinver is a remote wilderness of mountains and moorland dotted with lochs and lochans. As well as being a favourite haunt of hardy climbers and walkers, Assynt is a paradise for anglers. Most of the lochs are teeming with brown trout, and fishing permits are readily available throughout the area from the TIC in Lochinver or at local hotels, guesthouses and B&Bs. There's also salmon fishing on the River Kirkaig, available through the Inver Lodge Hotel, and on Loch Assynt through the Inchnadamph Hotel. The A837 Lochinver-Lairg road meets the A894 to Durness 10 miles east of Lochinver at Skiag Bridge by Loch Assynt. Half a mile south of here by the loch is the ruins of Ardvreck Castle. 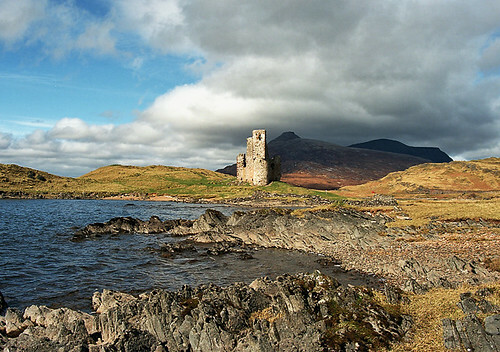 The castle dates from 1597 and was the stronghold of the Macleods of Assynt until a siege of the castle in 1691, when it was taken by the Seaforth Mackenzies. Before that, the Marquis of Montrose had been imprisoned here following his defeat at Carbisdale in 1650. Access to the castle is free, but the ruins are in a dangerous state and should be approached with care. Moderate 2 hour walk, well posted and with excellent views. Detached cottage near Clachtoll north of Lochinver. Sleeps four people in two bedrooms.